http://www.tampabayradio.com to listen to any show on demand! 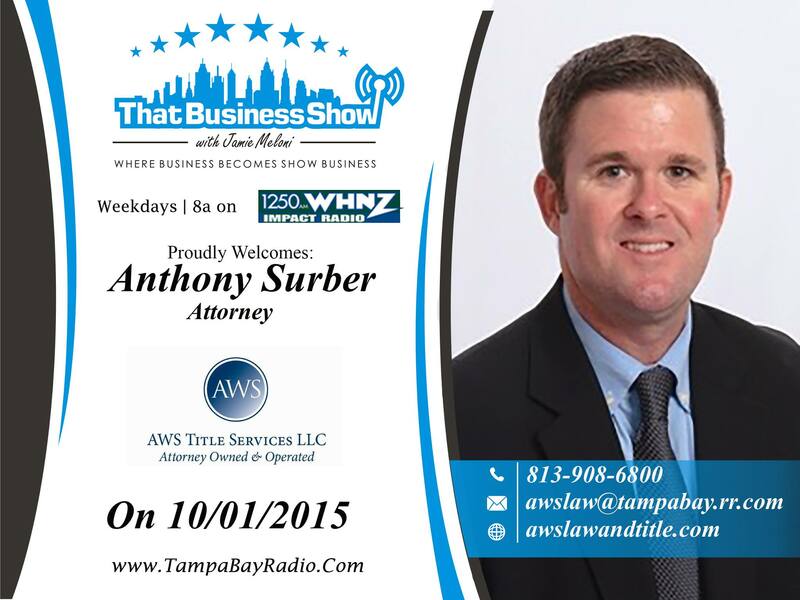 Opening up the show with Jamie Meloni was Anthony Serber, an attorney with AWS Title Services and Law. Anthony and Jamie first started to talk about how consumers rarely know that they have options when choosing their title companies when purchasing a home. In Florida as it turns out, attorneys like Anthony are actually able to do the same duties that title companies can. Anthony posits that since regular title companies have so much volume, they can’t effectively represent their clients’ best needs. Anthony prides himself on being more precise than the run of the mill title company who focuses on quantity instead of quality. You can learn more about Anthony Serber and AWS Title Services and Law at http://www.awslawandtitle.com/. 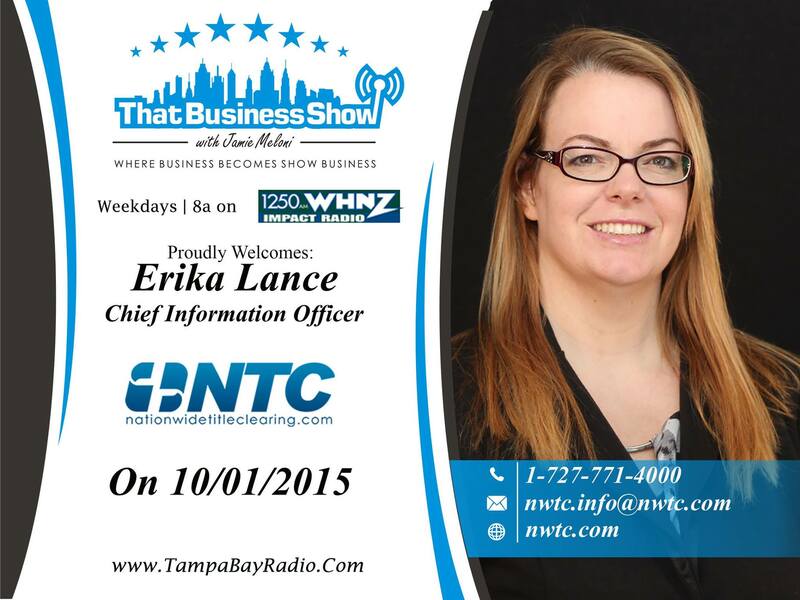 Joining Jamie as well on #ThatBusinessShow was Erika Lance and Gina Morales from Nationwide Title Clearing. Erika told us a bit of how she started and how she rose to eventually become the Chief Information Officer of Nationwide Title Clearing. She also told us a pretty impressive fact that #HelpsOurCity, Nationwide Title Clearing employs more than 400 people! Erika and Gina have helped NWTC to grow and expand. Nationwide Title Clearing is an expert research, audit and document processing provider. Recognized as one of the “Top 100 Workplaces”, Nationwide Title Clearing is also very focused on the community, donating over $60,000 to the American Cancer Society, and the list goes on! They have automated programs that ensure that future homeowners have “all of their ducks in a row!” and ensure the title won’t be in danger in the future. You can find out more about Erika Lance and Gina Morales, with Nationwide Title Clearing at nationwide title clearing http://www.nwtc.com. This entry was posted in Articles, Entrepreneurship and Business and tagged business, entrepreneur, radio, real estate, show business, talk. Bookmark the permalink.